Happy Mahalaya and Durga Puja to all. May Mother Durga bless us with Devotion, Knowledge and Bliss. This year Mahalaya fall on 15th October. Mahalaya signifies the end of Pitri Paksha and the beginning of Devi Paksha.It is said that Devi Durga begins her journey from Kailash to her paternal home on this day. This year the Goddess Durga arrives on an elephant and departs on a boat. Her arrival on an elephant signifies good harvest while her departure on a boat signifies flood, misery and good harvest. May Mother protect us all. October 20 2012 (Saturday) - Maha Sashti (Shashti). October 21 2012 (Sunday) - Maha Saptami. October 23 2012 (Tuesday) - Maha Navami. Durga, in Sanskrit means "She who is incomprehensible or difficult to reach." Goddess Durga is a form of Sakti worshiped for her gracious as well as terrifying aspect. Mother of the Universe, she represents the infinite power of the universe and is a symbol of a female dynamism. The manifestation of Goddess Durga is said to emerge from Her formless essence and the two are inseparable. She is also called by many other names, such as Parvati, Ambika, and Kali. In the form of Parvati, She is known as the divine spouse of Lord Shiva and is the mother of Her two sons, Ganesha and Karttikeya, and daughter Jyoti. 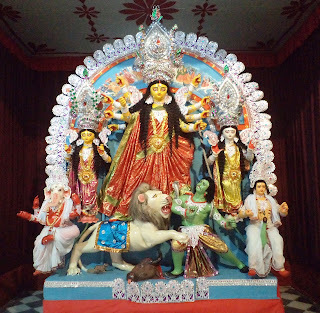 Destroyer of demons, she is worshiped during an annual festival called Durga puja, especially popular among Bengalis. There are endless aspects of Durga described in the Puranas and Agamas and the iconography is consequently very varied. She is usually pictured as having ten arms holding Sword, Conch, Discus, Rosary, Bell, Winecup, Shield Bow, Arrow, and Spear. She is most often shown riding a lion from which comes Her august name, Simhavahini, "She who stands astride the king of beasts". She is gorgeously dressed in royal red cloth and has several ornaments decorating Her personage. Her hair is dressed up in a crown (karandamukuta) which then flows out in long luxuriant tresses that are darkly luminous and soothing to the eye. The various tools reflect the eminent supremacy that helps in controlling the universe and obey Her will. Goddess Durga exists eternally, always abiding in her own sweet nature and inhabits the hearts and minds of her ecstatic devotees. As Shakti power, she shapes, nurtures, and dissolves names and forms, while as subtle spiritual energy called Kundalini, She lights the lotuses of the seven centres of awareness in the sacred human body. Goddess Durga killed the powerful demon Mahish and all his great commanders. When demonic forces create imbalance all god unite becoming one divine force called Shakti or Durga. Devi is the great Goddess of the Hindus, the consort of Shiva and she is worshiped in various forms corresponding to her two aspects: benevolence and fierceness. She is Uma, "light"; Gauri, "yellow or brilliant"; Parvati, "the mountaineer"; and Jagatmata, "the-mother-of-the-world" in her milder guise. The terrible emanations are Durga "the inaccessible"; Kali, "the black"; Chandi, "the fierce"; and Bhairavi, "the terrible." Durga, a beautiful warrior seated upon a tiger, was the first appearance of the great goddess. The circumstance of her miraculous arrival was the tyranny of the monster-demon Mahishasur, who through terrific austerities had acquired invincible strength. The gods were afraid of this water-buffalo-bull because neither Vishnu nor Shiva could prevail against him. It seemed that the joint energy of Shakti was only capable of vanquishing Mahisha, and so it was the eighteen-armed Durga who went out to do battle. She went to battle on her ferocious mount lion, armed with the weapons given to her by the other Gods. Durga is one of the angry and aggressive aspects of the goddess Shakti, whose role in Hindu mythology was to fight and conquer demons and also personify the Sakti or female aspect of any male deity. In the battle, she fought and killed the evil Mahishasura and restored heaven to the Gods. Since then the goddess is invoked for protection from the powers of evil. Durga Puja is observed in her honor, to celebrate her victory over evil. She has been worshiped from about 400 AD, but probably earlier, to the present. Her literary references are chiefly the Ramayana and Mahabharata, epic and Puranic texts, and she is mentioned by name in Vedic literature. In general, Durga is regarded in northern India as the gentle bride epitomizing family unity while in southern India she is revered more in her warrior aspect. As the ten-armed Goddess, Goddess Durga presents a radiantly beautiful form that is bewitching to behold. That special form is somehow simultaneously wrathful and benign and transmits profound spiritual teachings in an exacting manner. The nine-day period from the new moon day to the ninth day of Ashvina is considered the most auspicious time of the Hindu Calendar and is hence the most celebrated time of the year as Durga Puja. The Eighth Durga is "Maha Gauri." She is as white as a conch, moon and Jasmine. She is of eight years old. Her clothes and ornaments are white and clean. She has three eyes. She rides on bull She has four hands. The above left hand is in "Fearless - Mudra" and lower left hand holds "Trishul." The above right hand has tambourine and lower right hand is in blessing style. She is calm and peaceful and exists in peaceful style. It is said that when the body of Gauri became dirty due to dust and earth while observing penance, Shiva makes it clean with the waters of Gangas. Then her body became bright like lightening. There fore, she is known as "Maha Gauri" . 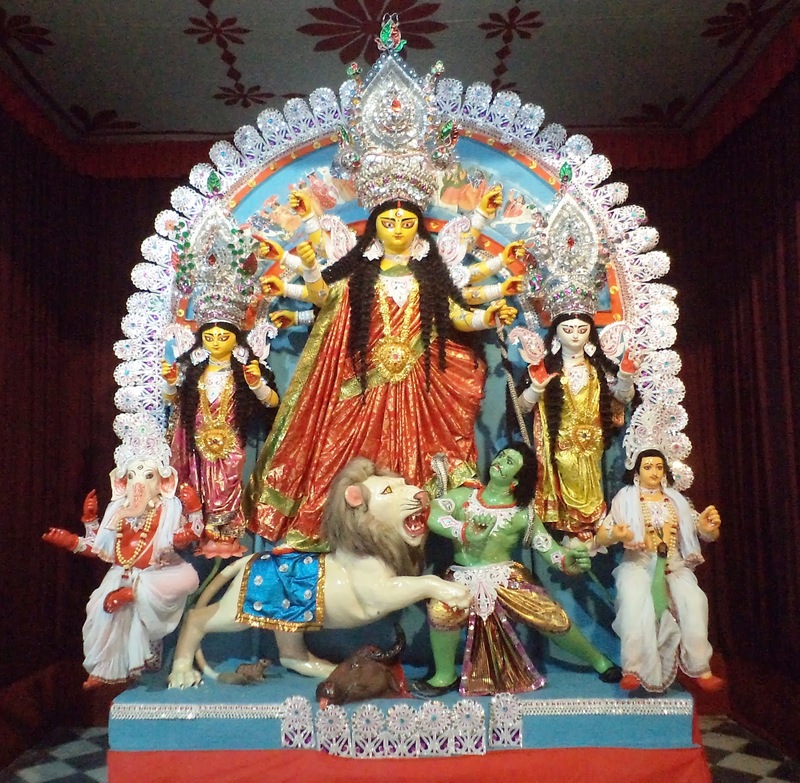 Ninth Durga us Siddhidatri. There are eight Siddhis viz., Anima, Mahima, Garima, Laghima, Prapti, Prakamya, Iishitva & Vashitva. Maha Shakti gives all these Siddhies. It is said in "Devipuran" that the Supreme God Shiva got all these Siddhies by worshipping Maha Shakti. With her gratitude the half body of Shiv has became of Goddess and therefore his name "Ardhanarishvar" has became famous. The Goddess drives on Lion. She has four hands and looks pleased. This form of Durga is worshiped by all Gods, Rishis-Munis, Siddhas, Yogis, Sadhakas and devotees for attaining the best religious asset. Navratri, the festival of nights, lasts for 9 days with three days each devoted to worship of Ma Durga, the Goddess of Valor, Ma Lakshmi, the Goddess of Wealth and Ma Saraswati, the Goddess of Knowledge.